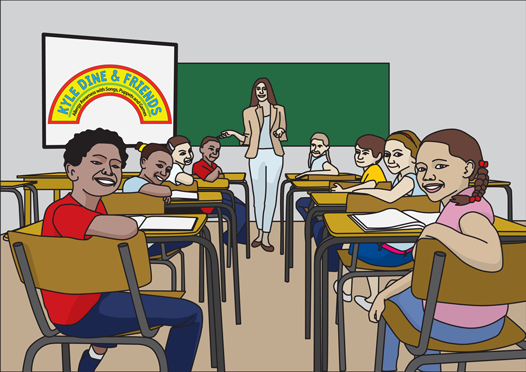 Bulk discounts available for school districts, libraries and support groups. The Kyle Dine & Friends food allergy awareness video is an exciting new resource that will educate children about food allergies. This allergy video takes a fun spin by teaching with music, games and puppets. Kids will be entertained and engaged as they sing, dance and clap along! Looking to order in bulk for your schools, support group or community? View special bulk rates. Hand Washing for Kids - Kyle Dine & Friends Allergy Awareness Video from Kyle Dine on Vimeo. Food Allergies Rock! Kyle Dine & Friends - Allergy Awareness for Kids from Kyle Dine on Vimeo. 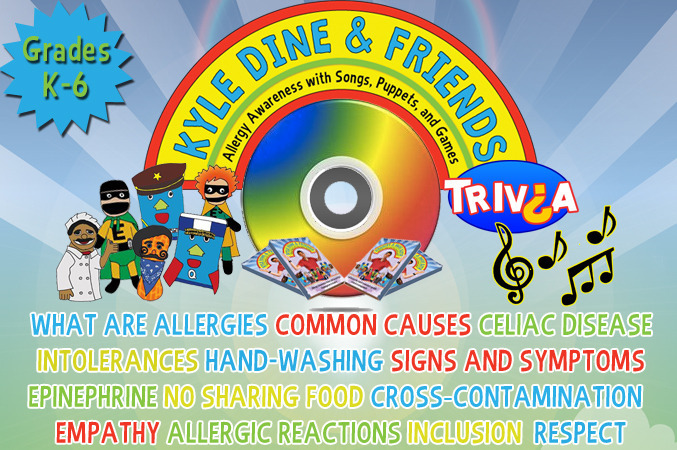 Cross Contamination/Cross Contact -Allergy Awareness clip from "Kyle Dine & Friends" from Kyle Dine on Vimeo. Anaphylaxis Emergency Procedure - Kyle Dine & Friends Allergy Awareness for Kids from Kyle Dine on Vimeo. Kyle Dine is a trusted allergy educator from Kingston, Ontario, who has created engaging presentations for children about allergy awareness. He has produced two professional CDs and worked for the past 7 years with Food Allergy Canada. He has performed for over 600 schools across the continent for nearly half a million children. His songs empower children with food allergies, and encourage those without to learn how they can help keep their friends with allergies safe. He is passionate on reaching more children with this potentially life-saving message and wants your help to create a video that schools can easily access and educate with. For more about Kyle Dine's live assemblies and booking info, please visit www.kyledine.com. For more about Kyle Dine's educational assemblies, please watch this video from the Spokane Public School Board. This video was funded on Kickstarter and raised $30,000! You Will Love Kyle Dine's Email Updates - Sign up!